The bones in our body provide a framework for support that every skeletal muscle, tendon, and ligament attach. Without this framework, we could not stand, walk, run, jump, etc. Our skeletal system also provides protection for the vital organs of our body: heart, lungs, etc. Various minerals such as calcium and lipids are stored in skeletal bones. Cortical bone (compact bone) – this is the outer most layer of the bone that is dense, but does have a few small opening for mineral deposits. Trabecular bone (spongy bone) – the inside of the bone that is spongy and has a honey-comb appearance. The spaces between this “web” are filled with bone marrow. 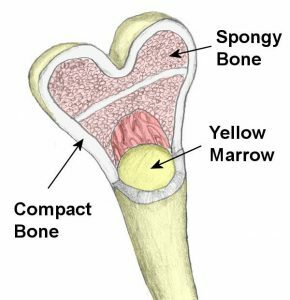 The bone marrow is made of lipids and where the blood cells (red blood cells, white blood cells, and platelets) are produced. The body is divided into two main types of skeletons: axial skeleton and appendicular skeleton. Appendicular – pelvis, shoulder girdle, upper and lower extremities (arms and legs). Our bone density is mainly determined during our peak growing years (adolescence) and into early adulthood when peak bone mass occurs. Research has shown that being physically active during these times positively affects peak bone mass later on as we age. Bone density is critical to prevent osteoporosis. Osteoporosis is the thinning of the bone over time causing the bone to weaken and increase the likelihood of fractures. 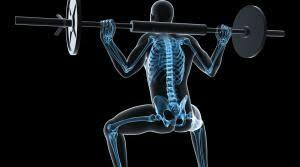 Exercise along with diet, play a significant role in the maintenance of bone density. While exercise is great for bone density, not all exercise is created equally in terms of bone stimulation. For the bone to be stimulated, there has to be enough force generated on the bone to produce the adaptation needed. While walking is a great activity, it will most likely not produce enough force since your body is used to walking. Higher impact activities would be needed to produce enough force (running, high impact aerobics classes, strength training). Low impact aerobic activity (swimming, cycling, elliptical, etc.) do not provide a big enough stimulus because the body is supported. Select exercises that are multi-joint and use as many muscles as possible. Use single joint, isolated exercises minimally. Choose exercises that direct forces through the hip and spine (osteoporosis is very common in the spine and hips). Use a weight that you can control that causes muscular fatigue for no more than 10 reps.
Make sure you are adequately warmed-up by performing your foam rolling and mobility exercises. Never done strength training before? Hire a personal trainer or do online training. These resources can provide you a great understanding of how strength exercises are done so you can feel confident you can perform them with correct technique.